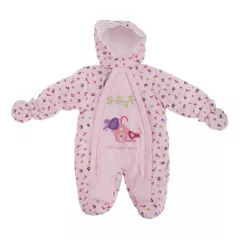 Hooded baby snowsuit with cute bird pattern detail. Double zip front with snap fastener at top. Built in booties and snap fastened detachable mittens. 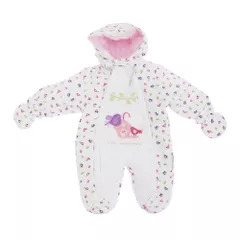 Warm, padded fabric with soft interior lining. Shell: 100% Polyester, Lining: 100% Cotton.